Aussie fans of America’s iconic sportscar have drooled from afar since news arrived of the C6 Z06, the fastest and most powerful production Corvette ever. Launched in late-2005, the Z06 version of the latest US-built two-seater has taken the already well-credentialed six-generation Corvette into the realms of supercar stardom, with a race-derived 427ci (7.0-litre) dry-sumped V8, upgraded brakes and suspension, carbon fibre/magnesium/fibreglass body and more aggressive, aerodynamic shape. Dubbed the greatest Corvette yet (and there’s been some beauties during its 54-year history), the Z06 is America’s Ferrari with a supercar-beating 0-60mph (0-96km/h) time of 3.7secs. But with no right-hand drive versions built, and Holden and HSV still umming and ahhing about introducing the performance icon into Australia, fans have been forced to turn to the handful of Australian importers which have government approval to import and convert the latest ‘Vettes. Enter Performax International (formerly Corvette Queensland), one of this country’s oldest and most experienced importers and converters of US-style SUVs, pick-ups and sportscars. The 18-year old company is offering a fully ADR-complied, right-hand drive converted Z06 Corvette with three-year/75,000km warranty, for $240,000. While this may sound a lot (in America the Z06 retails for around US$70,000), what you’re paying for is the complete ‘turn-key’ package. Performax sources and imports the cars, conducts the complex right-hand drive ‘mirror’ conversion (which takes four weeks and includes the fitment of new parts including door trim, fascia and steering box) and makes any changes necessary for road registration. The retail price for the conversion alone is $50,000; factor in luxury car tax, dealer mark-up and other costs, and it’s not hard to arrive at a quarter million dollars. 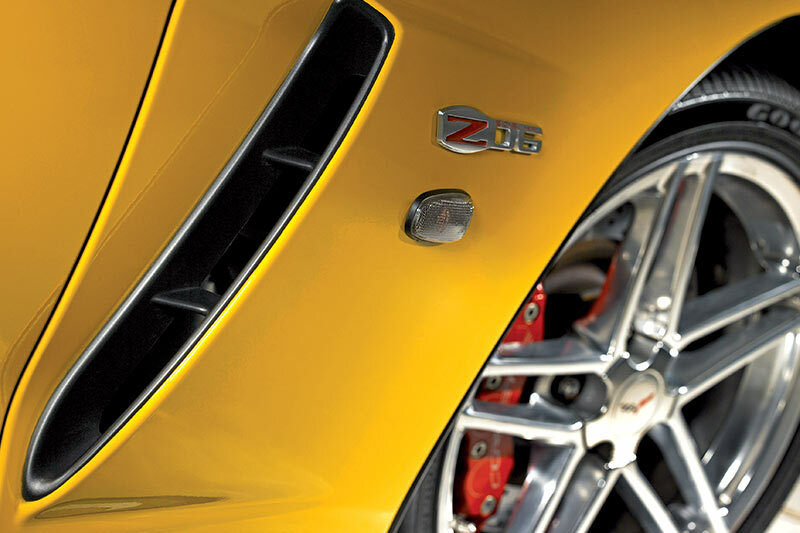 The Z06 is available only as a two-door coupe with six-speed manual transmission. The LS7 7.0-litre alloy V8 engine produces 382kW at 6300rpm and 636NM at 4800rpm, enough to propel the 1421kg car across the standing 400m in 11.7sec. Top speed is 319km/h. V8 fans will revel in the technical details of the high-revving, small-block 7.0-litre pushrod engine, which draws on the racing Corvette’s technology and features dry-sump oiling, titanium conrods and intake valves, a forged steel crank and forged pistons. 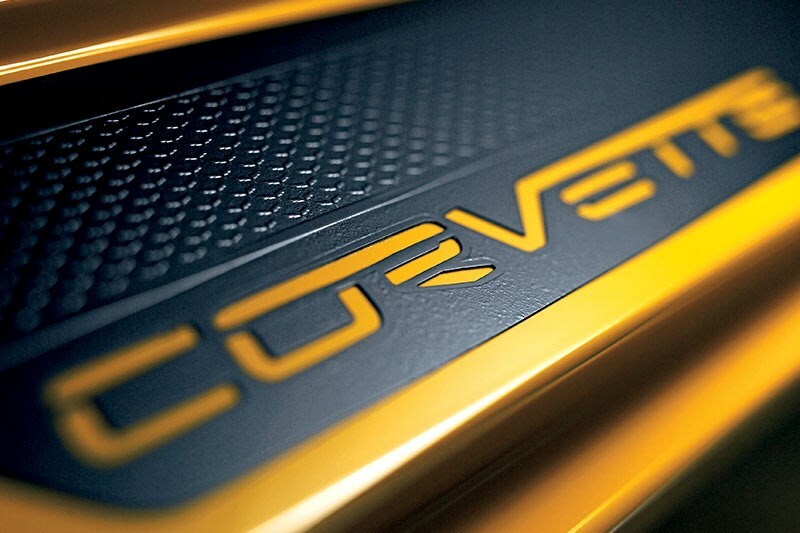 To keep weight to a minimum, the Z06 gets a magnesium roof panel, while its front guards are carbon-fibre. Additional scoops and aerodynamic aids, four rear stainless steel exhaust pipes and Z06 badging add to its racecar-for-the-road cred. 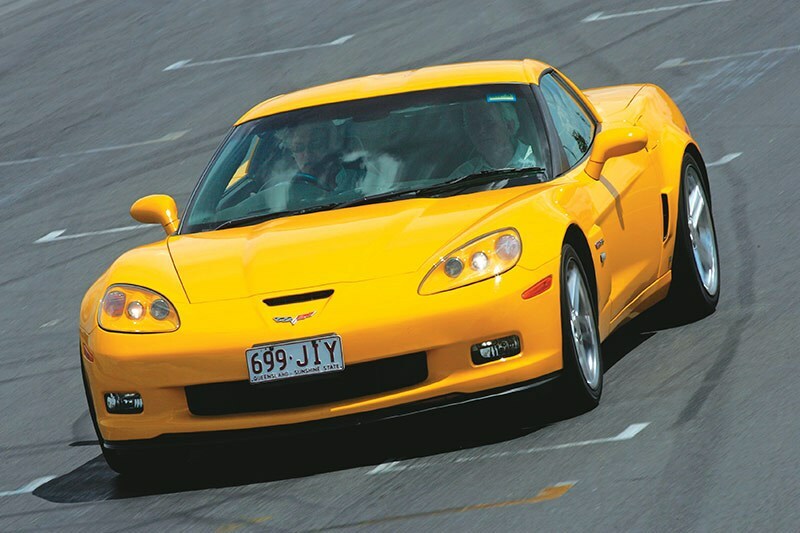 While we were limited to half a dozen hot laps during the launch drive at Queensland Raceway, it was enough to get a good idea of the awesome, all-round potential of this bad-boy Corvette. Right from the moment you drop the clutch it starts pulling like a freight train, the revs rising furiously as it surges towards its 7100rpm redline. The noise is muted at first, rising to a frenetic gravelly rasp from around 5000rpm. In fact, it was almost a touch too civilised for our liking; we were expecting a bit more aural activity at lower speeds. But as impressive as the straight-line speed and punch out of corners was the engine’s flexibility; third gear sufficient for the entire length of Queensland Raceway’s short circuit, despite some tight corners that would usually require second and a 200km/h main straight. Make no mistake, this is one of the most tractable powerplants we’ve tested, making any concerns about tall-gearing a non-issue. With traction control off, rear-wheel tyrespin was only ever a gentle prod of the throttle away. The only let down to the otherwise neutral, balanced cornering on the limit was insufficient grip from the standard Goodyear road tyres, making throttle-steering amid screeching rubber the only (and most fun!) option. No problems with the monster brakes though, which showed no signs of fade. We had little chance to test the Z06’s ride quality outside of the smooth track, so we suggest a thorough road test if that’s likely to be a concern. The driver sits low in an electrically-adjustable sports seat that when combined with the adjustable steering wheel, allows for a comfortable driving position although taller drivers may struggle for the perfect fit. Overall, the conversion appeared successful, with just a minor trim blemish or two to spoil the otherwise ‘factory’ look. 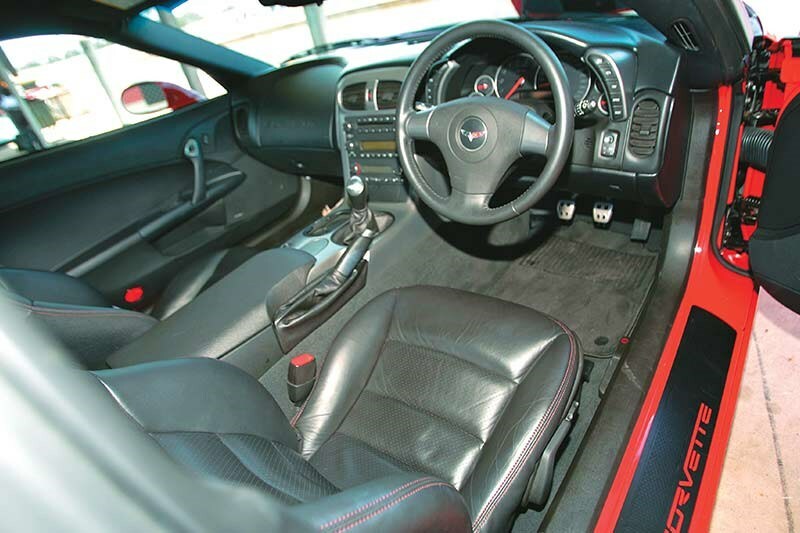 That said, the appearance of the black, low-key cockpit was underwhelming and looked dated, with only the odd Z06 badge stitched into the leather seats to take your mind from the cheap plastics and shiny dash-top vinyl. One neat feature was the ‘head up’ digital display that monitors speed, G-Forces, etc – perfect for track days. 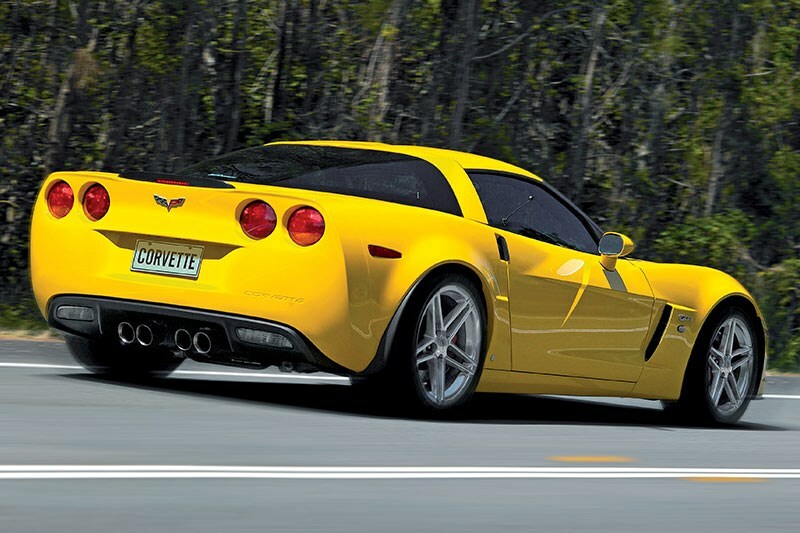 Performax aims to supply just 12 Z06 Corvettes annually. Pitched against the likes of the 911 GT3, V8 Vantage and Maserati GranSport, at least on price, our guess is that Z06 customers will come from the cashed-up Corvette/General-Motors’ muscle car fan club, or from that group of enthusiasts looking for an exclusive, high-performer to add to their existing multi-performance car garage. Meanwhile, word is that GM is working on an even hotter C6 Corvette called the SS. Expected to boast a supercharged V8 delivering 450kW-plus the car is due in 2008 as a rival to the forthcoming 450kW V10 Dodge Viper. Performance: 0-96km/h – 3.9ecs. Top speed – 319km/h.